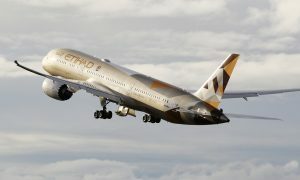 Etihad Airways has introduced the state-of-the-art Boeing 787-9 Dreamliner to its daily Perth – Abu Dhabi service. The B787-9 Dreamliner features Etihad Airways’ next-generation Business and Economy Class cabins. With 299 seats, it delivers 14 per cent more capacity than the Airbus A330-200 it replaces. In the high-demand Business Class cabin, it offers 27 per cent more seats. 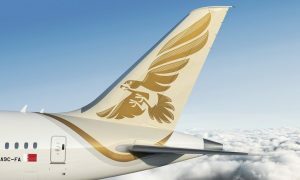 Etihad Airways Senior Vice President of Marketing, Shane O’Hare, said the decision to upgrade to the Dreamliner reflected the importance of Western Australia to Etihad Airways. “Since launching flights between Perth and Abu Dhabi two years ago we have enjoyed strong two-way demand from business and leisure travellers on the route. The Dreamliner, which adds 518 weekly seats to the route, gives us the extra capacity needed to meet this ever-increasing demand”. Mr O’Hare also commented on the contribution the new Dreamliner services would make to inbound tourism to Western Australia. The 28 Business Studios all offer direct aisle access, a fully flat bed of up to 80.5 inches long, and an increase of 20 per cent in personal space. Upholstered in the finest Poltrona Frau leather, the Business Studio is equipped with an in-seat massage and pneumatic cushion control system which enables guests to adjust the firmness and comfort of their seat. Each Business Studio has an 18-inch personal touch-screen TV with noise-cancelling headsets. Etihad Airways launched daily two-class Airbus A330-200 services to Perth in July 2014. Beyond Perth, Etihad Airways offers connections to eight towns and cities in Western Australia in conjunction with codeshare partner Virgin Australia. 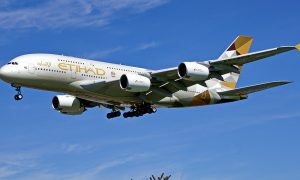 The partnership enables guests to seamlessly connect to Etihad Airways’ global network from Broome, Geraldton, Kalgoorlie-Boulder, Kununurra, Karratha, Paraburdoo, Port Hedland and Newman. In addition to the WA capital, Etihad Airways serves Sydney with double daily flights, in conjunction with Virgin Australia; double daily flights to Melbourne; and daily services to Brisbane. Perth is the second Australian city to be served by Etihad Airways’ B787-9 Dreamliner aircraft; Brisbane was the first in June 2015. The Dreamliner is also deployed to Singapore, Washington DC, Zurich and Düsseldorf. Services will commence to Istanbul, Johannesburg and Shanghai throughout the remainder of 2016. With a further 64 Boeing 787 Dreamliners scheduled for delivery over the next few years, the aircraft will become the mainstay of Etihad Airways’ long-haul fleet.